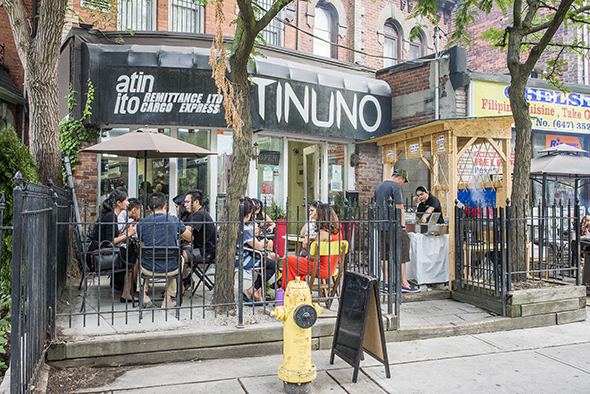 Tinuno is a homey Filipino restaurant in St. James Town. They're known for Filipino feasts which incorporate an incredible variety of traditional dishes into a smorgasbord eaten with your hands served on banana leaves. Here, everything comes off a grill. The name Tinuno means to cook with direct heat on a grill or hot fire, and ties everything together with sticky, smoky goodness. Everything is basic and traditional, with zero fusion elements. 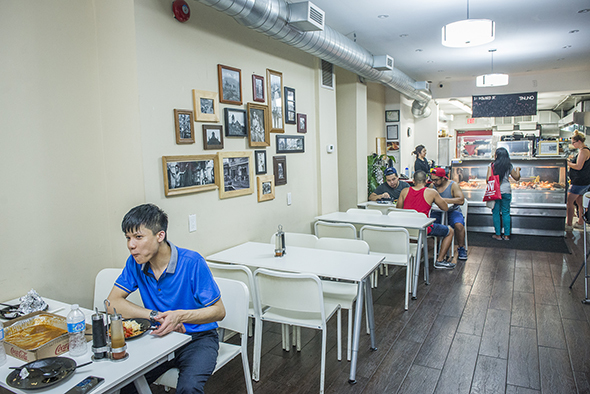 The lunch counter style interior is well suited both for eating in and take-away. A giant fridge takes up space near the front, and chairs and tables are scattered along one wall. 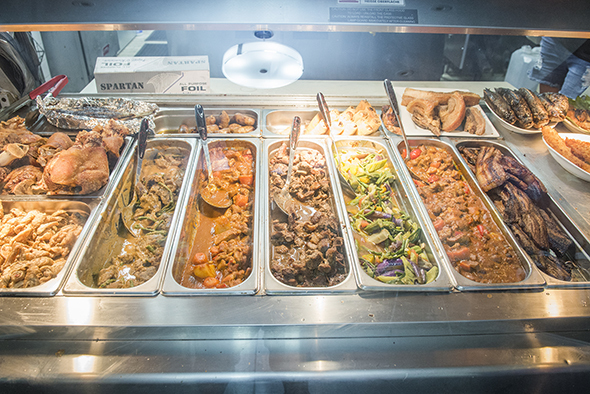 The kitchen is open air, lying beyond the counter with options for grilling like fish and pork belly laid out below, and with desserts in cases on top. Though unlicensed, they have a patio that pops off in the summer. It's adjacent to a grill outside where you can buy smaller dishes like skewers and five-dollar tilapia portions right off the street. The style of eating a grilled feast with one's hands is called "kamayan," which means hand to mouth. 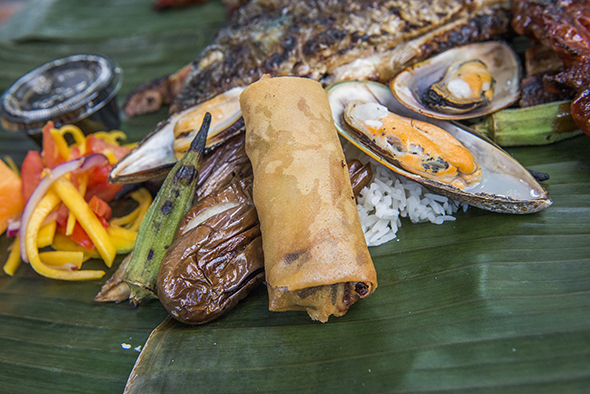 Banana leaves go directly on top of the table at Tinuno, and then a layer of sticky rice is doled out and covered with an array of items, mostly fish and meat. On the side there are spring rolls, plantains, okra, mango salad, and cantaloupe. For all this Tinuno only charges fifteen dollars a head. Fish items include mussels, milkfish, tilapia, shrimp, and squid rings. 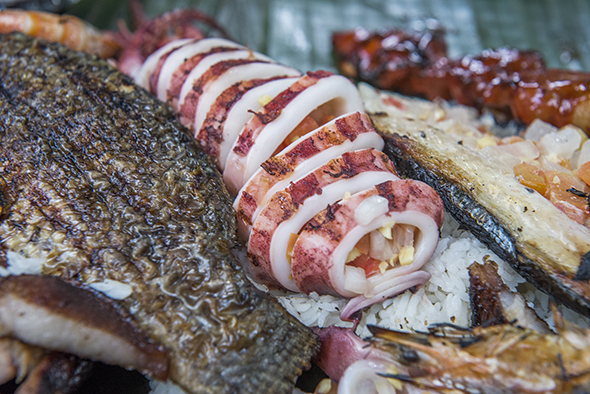 The squid and milkfish are stuffed with tomato, onion, green pepper, and ginger, and grilled with salt and pepper, and the tilapia is simply seasoned with salt so as not to overwhelm the flavour of the fish. 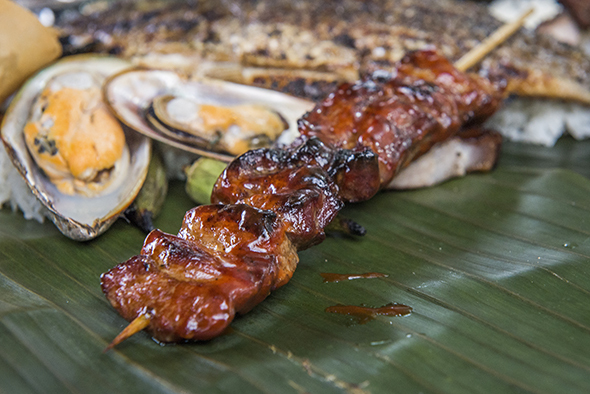 This feast would be a seafood medley if it weren't for the grilled pork belly and pork skewers. The meat's a little difficult and messy to get off the skewer with your hands, but it tastes great. The pork is enrobed in house-made sauce, a banana ketchup that chef Cathy combines with her own spice mix and a touch of pineapple juice. 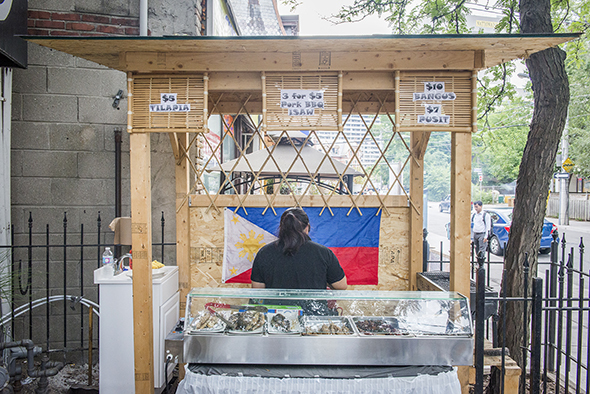 Tinuno also does halo-halo, a wildly colourful and unique Filipino dessert that has shown its pretty face more and more in Toronto. 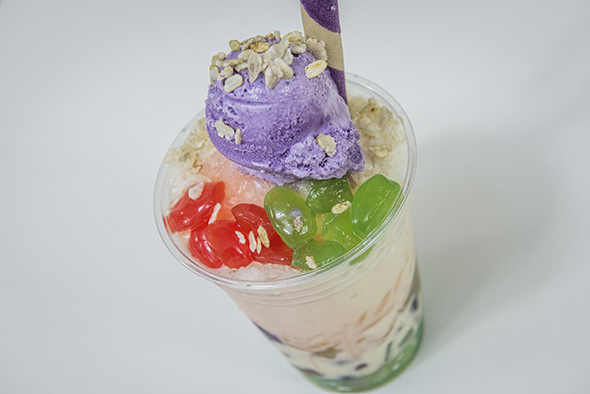 Condensed milk and shaved ice are topped with ube (also known as taro or purple yam) ice cream and fruit jellies. Tinuno garnishes theirs with a cookie straw striped in purple that matches the ube ice cream.